David R. Cheriton School of Computer Science professors Michael Godfrey and Urs Hengartner have been appointed as Association for Computing Machinery senior members. The Association for Computing Machinery (ACM), has named 45 distinguished members, including David R. Cheriton School of Computer Science director of Women in Computer Science Jo Atlee, for their individual contributions to the field of computing. Their achievements have advanced the science, engineering and education of computing, and highlight the growing role of computing in the major technological advances shaping society today. Raouf Boutaba, a professor at the David R. Cheriton School of Computer Science, has been selected as the winner of the 2016 TCIIN Technical Achievement Award. For the second time this year, Women in Computer Science (WiCS) at the University of Waterloo organized a three-day programming workshop for complete novices. 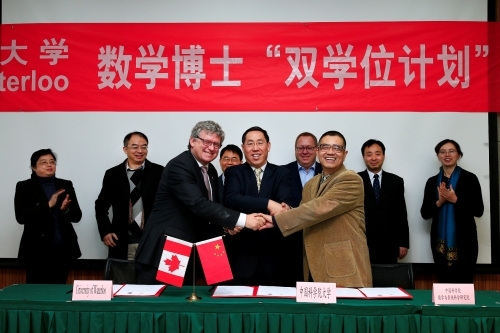 Photo: Representatives from the Faculty of Mathematics at the University of Waterloo, and from the Academy of Mathematics and Systems Sciences in the Chinese Academy of Sciences celebrate signing their dual degree doctoral program (cotutelle) agreement in Beijing.